Early last year we learned that one of our favorite Porsche authors, Randy Leffingwell, would be writing a new book to commemorate the 50th Anniversary of the Porsche 911. To say we were excited is an understatement. Not only did we want a copy for our reference shelf, we wanted to review it for you. Apparently, lots of others were excited, too. So much so, that each time we wanted to publish our review, there were no books in stock for you to purchase so we kept waiting and waiting. Finally, over the last month, Amazon and other retailers have been resupplied from the publisher and our review is ready to go. 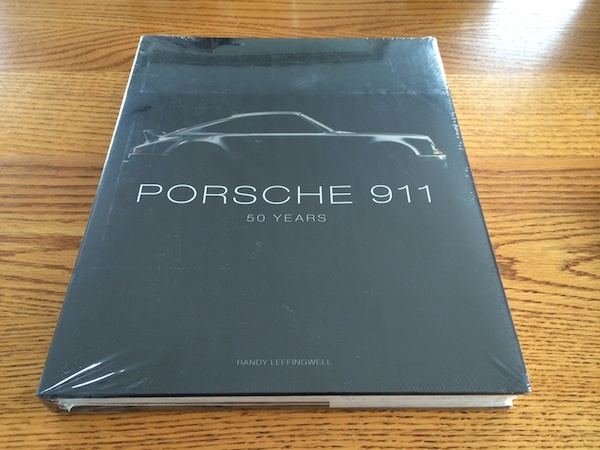 Name one other Porsche related Randy Leffingwell book. Please note, we'll only announce the winner in our e-newlsetter on the 25th of March. It will be up to you to contact us with your shipping info after the announcement. So, if you're not yet subscribed to our email list, be sure to do so now! Please email us your answers by 11:59 pm (EST) on Sunday the 23rd of March, 2014 by clicking here or using our contact form. Please don't post your answers in the comments as we won't count your answer and it just makes it easier for everyone else. We'll pool all the correct responses and then randomly select the winner. Anyone can play, but if you live outside of the US, you will be responsible for any import duties or tax. That's it, answer the questions and we'll see to it you receive Randy's newest book if you win and respond! I was absolutely honored to have met Randy at the Pebble Beach concours last year. He is truly a great guy, and I aspire to his level of automotive enthusiasm. I grew up a Ford enthusiast, and his Mustang books were my initial introduction to him, but his passionate prose about Porsche helped drive me toward the brand with even more fervor. Thanks Mr. Leffingwell, excellent book! Nice comment Bradley. I’ve found that Ford dudes/ettes tend to fall to Porsche and Chebbie dudes/ettes tend to gravitate to BMW. See if you notice the same. Happy March all. I answered the questions correctly in a prior post ! I want to win the book hey I am 60 and a half ! How much longer am I gonna be around . throw the old man a bone and let me win !! !